Author Dan Free of "Early Japanese Railways 1853-1914: Engineering Triumphs That Transformed Meiji-era Japan" (released by Tuttle Publishing and available through the SA-Amazon Store) received a graduate degree in law from George Washington University in Washington, DC as well as an undergraduate degree in French (with a dual minor in German and Italian) from Ohio State University. He's also studied Japanese and Korean. Dan has traveled extensively in Japan, China, Korea, Indonesia, Singapore, Nepal, Myanmar, and Thailand. Early Japanese Railways represents the culmination of 25 years of research on Dan's part and is a comprehensive work tailored to both scholars and casual readers (see the SA review below this interview). In the following interview, SA is the Samurai-Archives and DF is Dan Free. SA: Mr. Free, thanks for taking time to speak with the Samurai Archives. What factors led you to develop an interest in railroads, and Asian railroads in particular? Did your curiosity predate your discovery of the documents submitted in 1904 to 'The Locomotive Magazine' by Kashima Shosuke? DF: I grew up in a time when the prospect of air travel was beyond the means of most people I knew, and a train or ocean liner journey provided the early image of what travel was meant to be - trains that offered staterooms that converted from seats into your bed at night, after you'd returned from the dining car and a full day watching mountains roll by under a glass dome set in the top of a passenger car - or at least that was how it was presented, and the concept seemed good enough to me as a child. So I was intrigued by railways out of wanderlust, I suppose. My interest in Asian railways came considerably later as an adult. I had been an admirer of Isambard Kingdom Brunel, one of the great engineering geniuses of the first half of the 19th Century, and was in touch with several antiquarian book dealers in the UK specializing in railways and engineering to obtain materials on his Great Western Railway. By off-chance I ran across a packet of materials on turn-of-the-century Japanese railways among the stock of one of them. I'd been interested in East Asian culture generally since my teens and had by that time started a miserably small collection of Japanese ukiyo-e woodblock prints, so that packet was a curiosity that combined two of my interests. The lot turned out to be the Kashima Shosuke submissions, and of course those materials arrived a whole set of questions in tow and started a chain-reaction that two decades later led to the book. SA: The book features a nice blend of power politics, tech, and cultural impact. Was this a conscious decision on your part to make it more accessible to a general audience? DF: Yes. I realized that this was a classic example of a "niche market" book and that I had three constituents who might be interested: general readers with an interest in Asian history or culture, railfans, and scholars, and the trick would be to find the appropriate balance to please all three in order to appeal to as broad a market as possible. It was a bit like trying to find where the proper place to hit would be in a bull's-eye target that looked like a circle surrounding a three-point star. I never had any intent to produce something along the lines of the "Romance of the Orient Express" style coffee table books you find in a big-box bookstore, so I had planned to weight the book more heavily on a technical/scholarly bias, but as I got involved in the actual process of writing, realized that while an East Asian studies major would be conversant with the "railway colonialism" of the 19th Century, he or she wouldn't necessarily appreciate railway economics or engineering points and that a railway aficionado might have little if any grounding in Japanese history, and so on. So I found that I had to be sensitive to making sure issues and facts that I sometimes take for granted were put in proper context, at the risk of losing some readers' interest. SA: The Tokugawa Shogunate granted the United States the first railway concession in Japan in early 1868-a short line from Yokohoma to Edo. However, after the Shogunate was ousted from power, the Meiji government refused to recognize the grant although they had agreed to assume all international agreements made by the Bakufu. Why was this done and how did the Japanese go about nullifying it? DF: I think the ultimate reason that doomed the American efforts was the Japanese Government's fear of foreign control and the potential exposure to the dangers of colonization that was inherent in the Bakufu's concession, which envisioned that the projected line would be foreign-owned and operated. The new government hinted at this in its insistence that the line be built as an undertaking of the Japanese people - I forget the exact words. What was presented on its face as a matter of national pride and honor actually was masking the fear of colonization that was the chronic bête noire for the new Meiji government's policy makers. They couched matters this way for positive spin, as it was naturally not a subject openly discussed with their Western counterparts. The Japanese at the time had to play a very careful and delicate game of playing one power off against the other, all the while not becoming too dependent on any one of the powers at their doorstep. At bottom line, the Japanese government saw it as too big a step down the slippery slope of endangering the survival of an independent Japan. What I find intriguing and unanswered is why the American Resident Minister Van Valkenburg, his successor DeLong, and the Deputy Secretary of Legation Portman didn't actively push the concept of a compromise where the American government would agree to Japan financing (through American banks or markets or by its own means) and owning the railway, but build it using American equipment and technical advisors, which is, after all, how the project ultimately was structured with the British. We know that in the course of the negotiations the Japanese foreign minister offered to trade the railway concession for some other thing of value to the Americans, but no one at the American Legation seemed to have taken this as an opening to explore restructuring the terms of the grant to calm Japanese fears, while still salvaging a potential for American involvement as the source of equipment and technical advise. SA: The early decision made by the Meiji government to adopt a smaller rail gauge (3' 6") for their system than was generally used worldwide (4' 8 1/2") was to have far reaching consequences. How might the Japanese rail industry have developed differently had they used the Western standard? DF: The ramifications of that decision - and who actually made it is still not a settled point of history - are still rippling today, and the "what-if" scenario for the Japanese rail industry is timely. The three factors of the opening of access to the Trans-Siberian Railway to external shippers with the dissolution of the Soviet Union, the increased cost of petro-fuels, and the hazards of piracy off the Horn of Africa on the main Asia-Europe sea route have all combined to make the prospect of shipping Japanese goods to the markets of Europe by rail not only within the realm of feasibility, but increasingly attractive. China and Korea's railways are fortuitously both built to the standard gauge of 4' 8 ½“ used in almost all of Europe, and the US for that matter. And the simplest route would be across the narrow strait dividing Japan from Korea, then to China for transit through Manchuria, and on to Europe via the Trans-Siberian. There would be a notable time savings over the ocean route, and there would be a dramatic savings in fuel cost compared to a land route using conventional trucking. The problem of North Korea is an obvious stumbling block in such a scheme, but North Korea could be by-passed by rail-car laden ferries calling at Chinese ports, and Dalian or Lushun come to mind immediately. The Russian gauge of 5' is close enough to Europe's, China's, and Korea's that adjustable wheelsets could be devised for the railcars to handle the 3 ½ inch difference. This has been done for trains changing gauge at the Franco-Spanish border where there’s a break in gauge. But the gauge of Japan’s freight railway system is an obstacle. While the Shinkansen “Bullet Train” system has been built to the worldwide standard of 4’ 8 ½", freight traffic is still confined to the old 3' 6" gauge network, and for safety reasons, it isn't smart to have slow-moving freight trains moving in and out of passing sidings on a high-speed passenger network that is already congested enough. If you add one more "what-if", the equation becomes even more intriguing. What if Japan's colonial administration of Korea had been much more benign and focused on assisting Korea in attaining early independence rather than absorption into the Japanese state such that the two nations were now friendlier and on more trusting terms today? At some 33 miles, Japan's Seikan tunnel linking Hokkaido with the mainland is the world's longest undersea tunnel, beating the Channel Tunnel by a couple of miles, yet few people in the West are even aware of the fact that it exists. The Strait of Tsushima that divides Korea and Japan is only about 100 miles wide, conveniently interrupted roughly mid-way by the island of Tsushima. If Japan and Korea had had a less acrimonious history that now haunts them, and Japan had adopted "Standard Gauge", would we be reading press releases today about construction of an undersea tunnel linking the two nations, the prospect of shipping Japanese goods to Europe via the Trans-Siberian, and the possibility of stepping onto a Bullet Train in Tokyo bound for Seoul? The other side of the coin is the fact that it was the congestion and inadequacies of the Japanese narrow gauge lines that gave rise to the decision to build an entirely new network fresh from the ground up in the 1950s that came to be the Shinkansen or "Bullet Train" network. It was a very bold step when taken and hand-in-glove with it came the decision to be bold when planning for high speeds. If Japan had an existing Standard Gauge network in place, it is possible that a much more timid and budget-conscious approach might have been taken to traffic congestion problems in the 50s, and rather than a solution resulting in the so-called Bullet Trains, it might have been much easier and less risky to have simply quadruple-tracked the existing lines and use conventional trains. SA: As you point out in the book, the Japanese armed forces were generally opposed to the early rounds of rail construction (citing foreign influences, clashes over budget allocations, and conflicts over the use of land controlled by the military). What in your opinion was the turning point that brought them 'on board', so to speak, becoming enthusiastic backers of the railroads and increasingly involved with the planning behind them? DF: I think the point was driven home in a two stage process, and as often seems to be the case, not because the concept carried the day in principle, but because railways were put to the two separate "acid tests", didn't fail, and actually made the job of logistics easier for the military. This latter point seems absurdly obvious today, but there were deeply reactionary skeptics among the military in Japan in the early Meiji era who doubted that privately owned railways would be capable of coordinating transport and supply movements of such magnitude and could be - or ought to be - relied upon in times of national emergency. It was a concern of the era that wasn't unique just to Japan. The mid- to late 19th Century was a time when a spirited polemic was swirling in Europe and the US on just that point, when the state-owned systems of Russia, France, and Prussia/Germany were often cited as examples giving those nations a military edge in time of war over the UK and US with their publicly owned and operated systems. 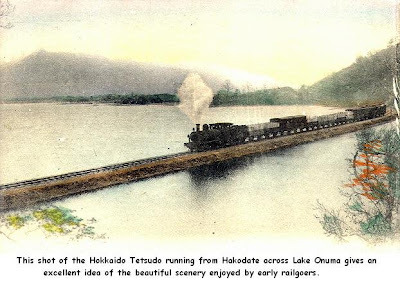 There were only about 65 miles of railway lines in Japan at the time of the Satsuma Rebellion in 1877, in two segments no less that were not even inter-connected. What support they provided was undoubtedly a welcome "nicety", but this probably served enough of a purpose to make more forward-thinking minds take note and enough to end the days of real, active opposition. But there was still a lingering concern among military thinkers that Japanese railways could be captured by invading powers and used against the Japanese. To the extent there was an actual "Eureka Moment" then it would have to be the Sino-Japanese War of 1894-95. Here was Japan, "little Japan" to paraphrase some of the commentators of the day, taking on China, the most powerful nation in Asia for century upon century. The Japanese railway network at that point stretched from Hokkaido in the north, down the entire length of the main island Honshu, with transversal lines accessing both coasts along the way, to Hiroshima, and had also reached into Kyushu. Out of necessity, the military discovered that the Government and publicly owned railways that formed the system could indeed coordinate their movements and sustain heavy transportation of critical resources and troops from almost every corner of the nation to ports of embarkation in southern and western Japan at levels never before attainable in Japan. China on the other hand had only one rail line, from Beijing to just beyond Shanhaigun, where the Great Wall met the sea in Manchuria, and precious few of its resources and troops from its vast interiors could be brought to the theatre of war as quickly and easily as Japan was able to, thanks in large part domestically to Japan's rail system. By the war's conclusion, the military thinkers had been converted almost en masse and they could barely contain their eagerness to be involved more closely in state policy and regulatory matters concerning railways. SA: One of the more interesting side stories in the book deals with 'Jinsha Tetsudo', or human powered railroads. These non-mining railways literally used manpower to push small railcars to local destinations, although the distances on some lines featured impressive levels of mileage. Were these unique to Japan, or did the Jinsha Tetsudo have parallels in other industrialized countries? DF: The key to this were two facts: Japan was horse-poor and Japan was capital-poor. There are any number of examples in both Europe and America, when a nation was in the infancy of its industrial development, of railways initially being horse-drawn - in fact in the early 1830s almost every nation that started building railways had tried it. Horses used to draw trains up what is now Park Avenue in New York City before the tracks were built under it, for fear passing steam locomotives would scare the horses in other traffic. But horses were a scarce and expensive commodity in mid-19th century Japan. On the other hand, human labor was cheap and plentiful. Japan simply borrowed a page from the industrial revolution playbook that had gone out of vogue in the West by, say 1839 or so, and with the usual Japanese ingenuity, adapted it to its own purposes. If the horses for hansom cabs or hacks like there were in London, Paris, Berlin or New York are too scarce and expensive, then we'll create the rickshaw. If we can't afford an expensive steam locomotive imported from England, or even horses imported by way of British India or California, then we'll make do with a railway powered by human runners - and that was the solution hit upon by small, rural railways serving villages where the traffic potential would never have justified the outlay for a stable of steam locomotives. So, while the concept was uniquely Japanese in inspiration, it was based on horse-drawn antecedents from the earlier days of the industrial revolution. As far as other Western industrialized countries go, I know of no man-powered railways that ever existed - it was cheaper in the long run in the US and Europe to buy and feed a horse than to pay a crew of men. But by the time Japan had become a colonizing power and raised its standard of living to the point where the Jinsha Tetsudo's days were numbered domestically, it built other examples of the Jinsha Tetsudo in both Korea and Taiwan - again, two countries where horses were scarce and expensive and where there was cheap and plentiful labor. SA: While the railways were best known for their role in economic development and military matters, they also had a major impact on the common people as the rail net slowly tied together every province of Japan. How was the life of an average Japanese citizen enhanced by this new technology? SA: What type of adaptations did the Japanese make in the locomotives and rolling stock built for them by the British, Americans, and Germans? Were there any unique contributions made to railroad technology by Japanese designers? In your opinion, what was the most successful Japanese-built locomotive design of the pre-WWI era? DF: There were few notable ones in the Meiji era, other than small modifications. Much rolling stock tended to be ordered from Western manufacturers "straight from the catalogue" and not special-ordered, to keep cost low. The first Meiji adaptation that comes to mind is that seats on domestic-built passenger cars in those times were often made deeper, so that a person could sit cross-legged in traditional Japanese style. Freight train cabooses or brake vans were seen as additional expense items for many railways during the Meiji era, so costs were saved by building a small cabin in box cars for the brakeman to ride in. You'll also notice in many of the photographs in the book that the cylinders that drove the connecting rods and cranks on locomotives were often inclined on an angle, which is much less prevalent in British, German or American steam locomotives of the day. This was done in part to give the front wheels added lateral clearance on the tight curves used on some of the narrow gauge lines and due to the tight loading gauge originally used in Japan. Of course, one of the most lasting adaptations, not to locomotives or rolling stock but to railway passenger operations, was the creation of the ekiben - the pre-packaged box lunch still sold in stations today. The truly revolutionary contributions Japanese designers were to make to railway technology would have to wait for the 1960s when they showed the world what the future of railway passenger transportation could be with the Shinkansen network. As far as the most successful pre-WWI era design, this was undoubtedly the 9600 class locomotive, which was introduced just before your cut-off point. They were initially intended as slow speed heavy freight locomotives or mountain helper units, but proved to be very serviceable Jack-of-All-Trades and lasted to the very end of steam in Japan. SA: As they are wont to do, the Japanese rapidly conquered the basics of railroad construction, phased out the foreign experts they had employed to help get them started, and began to set themselves up as exporters of rail technology to other locations in Asia. Did the Japanese model of exported rail construction differ significantly from, say, Britain's? Was it perhaps more suited to the tighter budgets and economic conditions found in China and Korea? DF: On lines like the former "Swatow - Chaochowfu Railway" in southern China, where Chinese administrators and investors hired the Japanese to serve as engineers, supply the equipment and rolling stock, and staff operations, they could be very cost-conscious, yes. On lines like the South Manchurian Railway, where national prestige was an issue because the line was one of the prizes of the Russo-Japanese War, and where there was a hidden political agenda in play, the Japanese built boldly, solidly, and to top quality, but seldom squandered resources on unnecessary extravagances. SA: Early Japanese Railways features an impressive display of period woodblock prints, photographs, postcards, advertising materials, timetables, and other visual aids-all of which are owned by you. Please tell us about the various sources you've procured these items from. Many of the captions are quite detailed, far exceeding the level of detail seen in other books. Was it difficult to ‘place’ many of the photos both as to location and on a timeline? DF: Any flea market, second hand bookstore, antique dealer, print gallery, post card collectors' convention, or antique fair became fair game. If I saw an old photo album at yard sale, I'd glance through it. It was something I came to be always on the look-out for. And yes there were quite a number of photos that presented challenges. One example is the photo of the first line of railway to be abandoned, which gave rise to a good bit of research to determine its route, in order to confirm that it ran alongside a river, as seen in the photo. A large number of the station photographs had to be checked to see whether the image was that of the first station building to be built, or a later replacement. The names of towns or stations could have changed, so I started to collect and buy any good Meiji or Taisho era atlas I could find to check route and right-of-way questions. The photo of the troops and horses at Muroran station gave me concern, as I suspected the uniforms might have been later in the WW I era. I had launched into researching Japanese military uniforms of the Russo-Japanese War and WW I before one of my correspondents in Japan was able to write that he had found an old newspaper article pin-pointing the troop movement in question to the Russo-Japanese War. Two of the photos ultimately not included in the book showed the aftermath of a railway yard and station after severe flooding, and while I felt fairly certain of the identity of the railway line, and could roughly guess an approximate date, there were no clues as to the name of the station. Again, several of my correspondents in Japan joined in the fun, and I can remember at one point we were attempting to guess the location based on which towns had a known pickle-producing industry in Meiji times, as there were numerous pickle barrels to be seen on the loading platforms or scattered about as débris in the photos. We never did succeed in pinpointing the station. Other times, information fell into my lap like ripe fruit. While I was researching a totally different issue, I unexpectedly ran across a reference to the date Otaru harbor improvements were made, which permitted me to give an approximate date to the photo of the hoisting gantry and construction locomotive on the breakwater being built in the harbor there. SA: During your extensive research done for the book, did you run across any information that surprised you or challenged any pre-conceptions you might have had? DF: I was surprised when I found the official US diplomatic correspondence that surrounded the original Tokugawa railway grant. Most of the other histories I had read rarely mentioned Anton Portman, and most failed to mention that he was the deputy chief of the US legation. I suspected that if there were anything of worth to be found in the official diplomatic records, some historian before me had already been there, and the fact that there was nothing of note mentioned in the histories I had read was an indicator that there would be nothing to be found in the diplomatic dispatches. So I was amazed when I found the materials emanating from the US Legation in Tokyo. I had started the book with the notion, obtained from British commentators and Japanese writers in English of the late 19th / early 20th Century period, that the breakdown of the Horatio Nelson Lay financial arrangements was something of an "unfortunate but innocent amicable misunderstanding." After I had obtained the US diplomatic materials, saw who was involved on the Japanese side, worked them into the existing timeline, and realized their import, I started to look more closely at the career of Mr. Lay, and came away convinced that there was a darker side to things - and that perhaps the British and Japanese writers of that era were being more circumspect in what they wrote out of a desire to gloss over past difficulties and put recent unpleasant dealings behind them. I was well along in later chapters of the book when I found those materials and I knew immediately that the first chapters would have to be substantially re-written. I think mine is the first book in English to bring this information to light. SA: You submitted your manuscript to Japanese rail historian Dr. Aoki Eiichi for review. Did any major changes arise from this or it was it more of a 'fine tuning' process? DF: Dr. Aoki's review didn't result in major changes, no. What it did result in was the usual number of "fine tuning" corrections, as you said, but more importantly the addition of a very generous amount of additional details and encouraging suggestions as to where I might add more exposition that would be worthwhile. Dr. Aoki was unbelievably kind in adding some notes that fleshed out additional names and dates and added elements of interest. SA: What other books might you recommend to readers looking for more on the subject of the Japanese railroad industry? Are you currently working on any other projects? DF: For English-language books, two come immediately to mind. The first is "A History of Japanese Railways 1872 - 1999", a collaborative effort in English by Prof. Aoki, Mitsuhide Imashiro, Shinichi Kato, and Yasuo Wakuda, East Japan Railway Cultural Foundation, 2000, ISBN 4-87513-089-9 and well worth having. The second is the Harvard monograph of Prof. Steven Ericson, "The Sound of the Whistle", Harvard Council on East Asian Studies, 1996, ISBN 0-674-82167-X which details the history of finance and state policy decision making concerning railways in the Meiji era far better that I could ever have done. For those who read Japanese, the ultimate is Japan National Railways' ten-volume official history which was produced in 1972 on the hundredth anniversary of railways in Japan, now unfortunately out of print and increasingly hard to come by even in Japan. For modern railways, Prof. Christopher Hood has produced a timely volume titled "Shinkansen: From Bullet Train to Symbol of Modern Japan", Routledge, 2007, ISBN 0415444098. To answer your second question, yes, I've turned my attention to China and have started work on a companion volume on railways there before 1914. SA: Thanks, Mr. Free-it's been a real pleasure speaking with you. Excellent interview! The conversation about the long-term consequences of Japan's choice in rail gauge was particularly interesting. I must admit that I have not yet had a chance to read the whole interview, but I absolutely plan to. Thank you so much for taking the time to do this, and sharing it with us all.